Pierre Méchain (16 August 1744 – 20 September 1804) was the son of a plasterer in France. In his early childhood and teen years, he showed promise in mathematics and science, but had to drop out of school due to a lack of money. 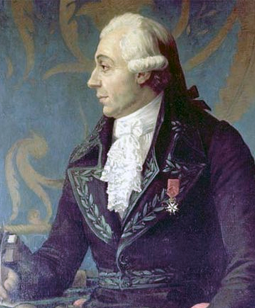 Pierre worked primarily as a mapmaker, until the age of 38, when he was accepted into the French Academy of Sciences. His love of maps led him into astronomy - the "mapping" of the universe. He wrote and published several papers related to astronomy and was a major contributor to the field throughout his life. On January 17, 1786 Méchain searched for comets in the constellation Aquarius and spotted a comet, which had grown a slight tail. The comet was again observed by Charles Messier on January 23, but was not seen again. The comet's second "discovery" came in November of 1795. Caroline Herschel spotted the comet, which soon became visible to the naked eye. It made its closest approach to Earth on November 9,1795 when it passed .26 AU from our planet. The third observation was next observed by Jean Louis Pons on October 20, 1805 when it became visible to the naked eye. At the time, it was not recognized as the same comet spotted by Méchain in 1786 or Herschel in 1795. After another observation of the comet in 1818, Johann Franz Encke finally determined its orbit. The comet’s orbit allowed Encke to rewind the clock in the sky, and theorize that the comets spotted and described in 1786, 1795, 1805 and 1818 were the same comet returning through the inner solar system. Encke published his discoveries and theories in the March, May and June issues of Correspondance Astronomique. It marked only the second time in history that a comet's periodic orbit was determined. The first was Halley’s Comet (1P/Halley). The third was Comet Biela in 1826. Since comets can take hundreds or even thousands of years to return to our inner solar system, where they can be observed with a telescope, it was a feat to be able to predict the return of a comet in the early 19th century. Of course, Encke's Comet was visible more frequently in the solar system than any other comet. In fact, it never went further from the Sun than Jupiter. After Encke correctly predicted the return of this comet in 1822, it became known as Encke’s Comet (2P/Encke) due to his laborious work on the subject. Comet Encke, like Halley’s Comet, is highly unusual since it’s named after the person who determined its orbit and not its discover. The next forty-eight comets to have their orbital period determined are included on this site in a list of periodic comets. Comet Encke is believed to have entered the inner solar system millennia ago and was prevented from returning to the Kuiper Belt by the gravity of Jupiter. Comet Encke orbits our Sun once every 3.3 years, which is the quickest shortest orbital period of any comet. It never orbits beyond Jupiter. Like other comets it once spent the majority of its life in the Kuiper Belt or Oort Cloud. However, on one particular orbit centuries or millennia ago, it was prevented from returning to the Kuiper Belt by the gravity of Jupiter, which kept it in the inner solar system. Since it never comes within 0.9 AU of Jupiter or 0.3. AU of the Sun, Comet Encke is now in a relatively stable orbit. Comet Encke last perihelion was on November 21, 2013. It was visible with binoculars, beginning in late September of 2013 in the evening skies. It was one of the brightest comets in 2013. After Comet Encke transited the Sun, it was visible in the morning sky in December. Comet Encke has the shortest orbital period of all known comets at 3.3 years. It's next perihelion will be on March 10, 2017. Four simultaneous points of view of Encke's orbit (2P/Encke). Click on icon in lower right corner to enter full screen HD mode. Comet Encke's (2P/Encke) orbital path is only inclined five degrees compared to the ecliptic. Earth's position in space and the outgassing of Comet Encke are two of the factors that determine when, and if, this comet will become visible to the naked eye at some point in its path around the Sun. The comet can complete several orbits without ever being visible to the naked eye, but it can be seen regularly with a telescope. Comet Encke appears to be getting fainter with each passing orbit, largely because it's shedding material more rapidly than comets that spend the majority of their life in the Kuiper Belt or Oort Cloud. The brightest apparent magnitude of Comet Encke on record was 3.5 in 1829. In ancient times, it was much brighter and undoubtedly had an effect on our ancestors. Our ancestors must have stared at Comet Encke for nights on end, wondering what Comet Encke really was, how big it was, and how far it was from the land. Although their have been great leaps in the understanding of comets, only recently have we been able to determine the size of Comet Encke. It's nucleus is estimated to be 2.98 miles (4.8 km) in diameter. In 2000, Fernandez suggested that the nucleus is elongated with an aspect ratio of 1 : 2.6, and that it rotates once every 15.2 hours. These findings were in keeping with results determined by Luu and Jewitt, in 1992. 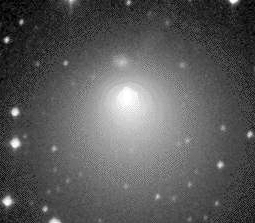 Comet Encke imaged using the 0.91-meter Spacewatch Telescope at the Kitt Peak Observatory in Arizona. Since Comet Encke's orbital path is near the ecliptic, its path occasionally changes due to the gravitational influence of planets. The Taurids and Beta Taurids, which are a meteor showers occurring in November and June, are believed to be the dust trail left by Comet Encke. The Taurids were observed in 1869. Meteors from the Northern Taurids were observed by Giuseppe Zezioli in Italy from November 1-7 while the Southern Taurids were observed by T.W. Backhouse in that same year on November 6. Neither, however, identified it as an annual meteor shower radiating from the constellation Taurus. It wasn't until 1918, at the end of the World War, that Englishman Alphonso King made the connection and announced the existence of this annual meteor shower. Sending spacecraft to investigate comets had been considered since the 1960s. In August of 1974, the Space Science Board (SSB) of the National Academy of Sciences approved a plan to fly two US Spacecraft near Comet Encke in 1980. The reason Comet Encke was chosen, is because it was a prominent Jupiter Family Comet with thousands of observations. In short, its orbit was predictable. On August 24, 1980 two probes were launched by a Titan-3E rocket with a Centaur upper stage. The probes would fly closest to Comet Encke, one day after its perihelion, on December 7, 1980. Probe 1 passed 824 kilometers from the nucleus. Probe 2 passed through Encke's dust tail. In 1985 and 1986, US Spacecraft studied Halley's Comet (1P/Halley) before and after perihelion. 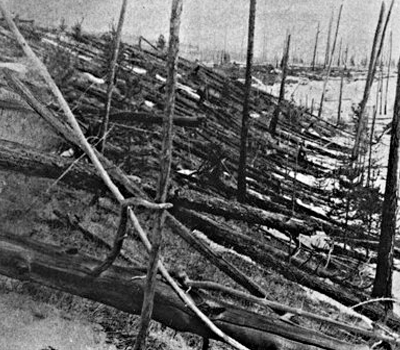 On June 17th, 1908, around 9 a.m. a comet or asteroid exploded above an uninhabited area of Siberia near the Tunguska River. Comet Encke may have been responsible (L. Kresak in the Journal Astronomical Institutes of Czechoslovakia Bulletin, vol. 29, no. 3, 1978). The blast in 1908 leveled an estimated 80 million trees covering 830 square miles (2,150 square km). Its explosive energy was estimated at fifteen megatons. For comparison, the bomb dropped on Nagasaki near the end of World War II was .023 megatons—652 times less powerful than the object that exploded over the Tunguska River in 1908. The last nuclear bomb to be used in warfare simply took more lives since it was dropped intentionally on a heavily populated area. Imagine if Earth had spun a couple more hours on its axis and the airburst happened not over an unpopulated area in Siberia but over London. The city and surrounding area would have been leveled, killing millions. Want to know more about the Tunguska Meteorite and other famous meteorites? We've explored the discovery, orbital path, orbital period, size, meteor showers and next perihelion of Comet Encke. What other facts for Comet Encke are left to explore? Well - Comet's Encke's tail is relatively short, from Earth's perspective, covering only 3 degrees of sky at its greatest in 1805. This pales in comparison, to some comets in recorded history, which covered 90 or 100 degrees. Think about that for a minute. Imagine looking straight up and seeing a comet nucleus with a tail stretching all the way to the horizon.